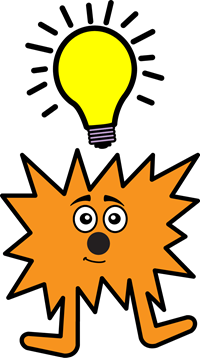 Inspire students to use their imaginations for digital storytelling with a twist – write in the style of a cartoon. TechnoToon is an all new technology project in which students create a digital story as an animated comic strip. Students love the visual format of cartoons. The recent boom in graphic novels for children and teens confirms how popular this genre has become. Hook student interest by developing writing skills using the comic strip format and then animating the story! In TechnoToon, students use Google Slides or Microsoft PowerPoint to construct a story with text boxes, images, callouts, starbursts, and word art. Then transitions are inserted between slides to divide the scenes. Finally, animation is applied to objects to sequence the timing of events. Upon completion, the digital story is published as a link with the slides set to play automatically. Challenging extension activities support learning with optional assignments such as advanced animation techniques, collaborative peer-editing, or screencasting. Hook student interest with digital storytelling. 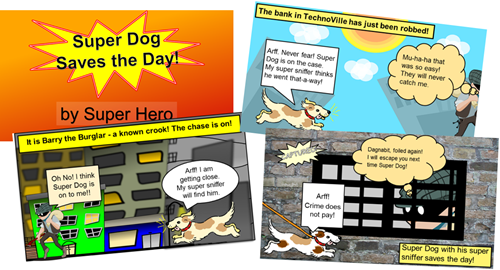 Create an animated comic with Google Slides or Microsoft PowerPoint. 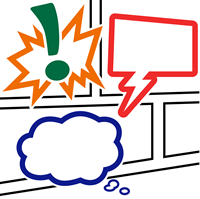 The TechnoToon teacher guide includes many ideas for integrating comic style writing into curriculum: language arts, social studies, science, health, and history. Build computer and writing skills with a highly motivating, fun technology project. In the illustrated, step-by-step instructions, the student workbook includes story ideas, practice templates to complete, a plot planner, image search tips, a checklist, and more. Many sample digital stories created in Google Slides or Microsoft PowerPoint also inspire creative ideas. Optional extension activities offer enrichment suggestions and advanced animation techniques. Writing a digital story as an animated cartoon is a sure bet to capture the imagination of young writers!